Considering the variety of flora and fauna found in mega biodiversity hotspots across the country, many rural communities particularly the tribal people depend upon these diversified number of plant species as natural crude drugs those can be used in treatment of various diseases and disorders . Thereby, India is a geographic source of variety of rare medicinal plants traditionally used in treatment of various illness. Present research work consists of study of morphology and microscopy of rhizomes of one of such a rare plant, Alectra parasitica A. Rich. var. chitrakutensis. Alectra parasitica A. Rich. var. chitrakutensis (Scrophulariaceae / Orobanchaceae) is a rare medicinal plant which grows as parasite on the roots of Vitex negundo L. (Verbenaceae) nirgundi plant, found particularly in Chitrakut region of Madhya Pradesh and Uttar Pradesh, states of India [2,3]. This plant has also been reported from Bundi District of Rajasthan  and Akola District of Maharashtra . The word ‘Alectra’ is derived from Greek phrase, alektros means ‘unwedded’; a ‘without’ and lektron ‘couch’  while ‘parasitica’ stands for word parasite which means ‘depends upon other organism for nutrition’. It has been found mention in Ayurveda for treatment of leprosy, vitiligo, skin diseases, rheumatism, constipation, intestinal worms, fevers, swellings, paralysis and tuberculosis . Its antibacterial potential evaluated against S. aureus, B. subtilis, E. coli, P. vulgaris, S. typhi, P. aeroginosa, S. pnemoniae while antifungal activity tested against A. niger and C. albicancs were also reported . So far, only two phytocompounds, azafrin and mannitol have been reported to be present in Alectra parasitica A. Rich rhizomes . So far, no report found discussing about detail morphology, microscopy, powdered characteristics and preliminary phytochemical analysis of Alectra parasitica A. Rich rhizomes. The rhizomes were obtained from Chitrakut region of Uttar Pradesh, India (Figure 1). Plant material was rinsed under tap water and allowed to dry. Initially, detail morphology was studied in terms of organoleptic characters like size, shape, texture, color, odor, taste. Then, sample was studied microscopically to describe histological set up of tissues in rhizome via examining transverse section (TS) and characteristics of powdered rhizome. Transverse section and powder were stained with phloroglucinolcon. HCl (1:1) and observed under microscope. Figure 1: Map of Uttar Pradesh and Madhya Pradesh regions of India. 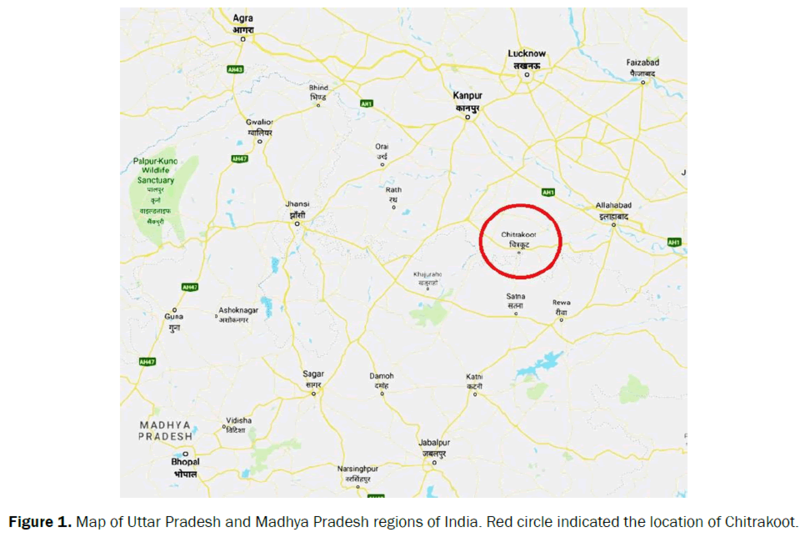 Red circle indicated the location of Chitrakoot. About 10 gm of dried powder of rhizomes was successively with 100 ml of petroleum ether, acetone and methanol. Extracts were concentrated under reduced pressure using Rotary evaporator. Then, extracts were tested for presence of class of phytocompounds by simple chemical tests based on color change or precipitation as reported previously by Yadav et al. . Dried rhizome pieces were 2 to 4 cm long, 5 to 7 mm thick, cylindrical, irregularly bent having longitudinally striated rough surface, covered with closely apprised, protruding, thick, scaly scars, fracture short, dark brown or deep yellow in color (Figure 2), taste initially bitter latter producing tingling sensation on tongue, odor disagreeable. 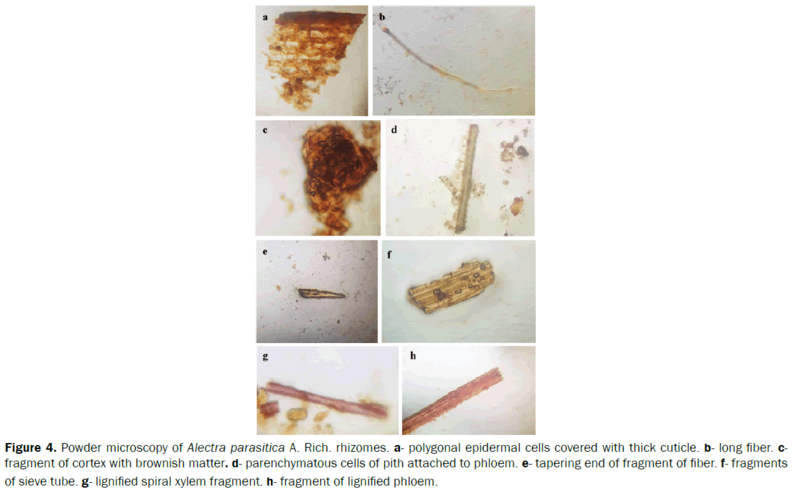 Figure 2: Dried rhizomes of Alectra parasitica A. Rich with their aerial stems. Detailed transverse section (TS) of rhizome shows a layer of outer epidermis embedded with dark brown pigment and covered with cuticle. The cells are uneven and irregular in thickening, cortex is narrow, parenchymatous, and the cells embedded with tannins, stellar tissue composed of a continuous ring of wedge shaped xylem vessels encircled by ill developed 2 to 3 rows of cambium and peripheral narrow phloem tissue. In between layers of cortex and vascular bundle, there is cluster of thick yellowish walled cells representing formation of haustorium on the host, Vitex negundo roots. Radially, there are thick walled uni- to multi seriate medullary rays in continuation with phloem. Pith is very wide, encircled by peri-medullary groups of parenchymatous, cells embedded with starch grains. Pith cell are polygonal (Figure 3A & 3B). Figure 3A and 3B: Transverse section (TS) of Alectra parasitica A. Rich rhizomes stained with phloroglucinol- conc. HCl (1:1) and recorded at 10X magnification on compound microscope. A- Schematic diagram of TS. B- Detailed TS of Alectra parasitica A. Rich rhizomes observed. Ctcortex, e- epidermis, pi- pith and vb- vascular bundle. Microscopic features of powder were found as angular, thin walled cells of epidermis in surface view, embedded with brown pigment; xylem vessels with reticulate, spiral and with pitted thickening, pith cells lignified and with pitted wall, trichomes and occasional stomata from aerial stem part, simple and compound starch grains, tannin cells from cortex (Figure 4). Figure 4: Powder microscopy of Alectra parasitica A. Rich. rhizomes. a- polygonal epidermal cells covered with thick cuticle. b- long fiber. c fragment of cortex with brownish matter. d- parenchymatous cells of pith attached to phloem. e- tapering end of fragment of fiber. f- fragments of sieve tube. g- lignified spiral xylem fragment. h- fragment of lignified phloem. Light brown colored petroleum ether and acetone extracts showed presence of terpenes and carotenoids. Depending upon polarity of phytochemicals present in powdered material, brownish methanolic extract showed presence of carbohydrates, polyphenolics and triterpenoids. In present research attempt, we procured the rhizomes of a very rare plant, Alectra parasitica A. Rich. from Chitrakut region of Uttar Pradesh. Its transverse section and powdered characteristics were studied thoroughly, and preliminary phytochemical testing was performed to determine the type of Phyto-compounds present in it. Authors are thankful to Dr. Ashok Tiwari, Chitrakut, India for providing the plant material. We are also grateful to Dr. (Mrs.) Anagha M. Joshi, Principal, SCES’s Indira College of Pharmacy, Pune, India for providing laboratory facility for this research work. 1.Sharma S and Thokchom R. A review on endangered medicinal plants of India and their conservation. J Crop Weed. 2014;2:205-218. Rau MA. Occurrence of Alectra parasitica A. Rich in India−A new variety of Banda district, U. P. Bulletin of the Botanical Survey of India. 1961;3:25–27. Saxena HO, Shukia GS, Indorkar PS. Occurrence of Alectra parasitica A. Rich var. chitrakutensis Rau in Madhya Pradesh. Indian Forester. 1969;95:485–486. Sharma SK and Bhutya RC. Alectra chitrakutensis (Orobanchaceae) in Bundi District, Rajasthan, India. 2013;2: 142-143. Kakpure MR and Rothe SP. Phytochemical screening of Alectra parasitica A. Rich – a rare medicinal parasitic plant. Adv Res Phar Bio. 2012;1:103-111. Bedi R. Alectra parasitica var. chitrakutensis. Economic Botany. 1965;21:277-283. Quattrocchi U, CRC World Dictionary of Medicinal and Poisonous Plants. Boca Raton. 2013. Kakpure MR and Rothe SP. Alectra parasitica A. Rich. An Unexplored parasitic plant with potential as Antimicrobial agent. Bioscience Discovery. 2016;1:25-29. Rajgopalan TR and Seshadri TR. Chemical compounds of Alectra parasitica. Curr Sci. 1964;6:174-175. Yadav M, et al. Preliminary phytochemical screening of six medicinal plants used in traditional medicine. Int J Pharm Pharm Sci. 2014;5:539-542.